If you're liking the title I can't take credit. It's from the line "Legalize Frostitution" from Seattle's Cupcake Royale. But these are some styled shots of my weekend's baking escapade. Since this will be the larger focus of my week you may even get subjected to more, Kids. But what's an Uncle to do? I mean, c'mon, they're just too damn cute! (Good lord...it's like they're pictures of my kids or something! Anyone have a referral for a good therapist?) Okay...and I must say, they're pretty tasty too if I do say so myself. OK, that wasn't my best work. I'm still recovering from last night's Papaya King Anniversary Celebration. Oh, how you kill me!! I think I have a little spittle on my chip now... they look so damn good. I meant chin, not chip. But see you have me thinking about food now! I wish I was going to be at YOUR house this week. Dee-lish. I would like a chai frosted cupcake pls. I think cupcakes are the happiest little souls in all the land. Nice job with the frosting! Those look spectacular! Is it raspberry icing on the pink ones- I think I detect some sort of texture. luscious! thehomebound...you know it's good when "spittle" or "drool" get brought up! So thanks for that! And thanks for commenting! Nice to have you here! Megan...I am refining my recipe for my Chai buttercream as we speak! So clearly we have connected over cyber-pastries here, Megan! Miss B...Thanks! 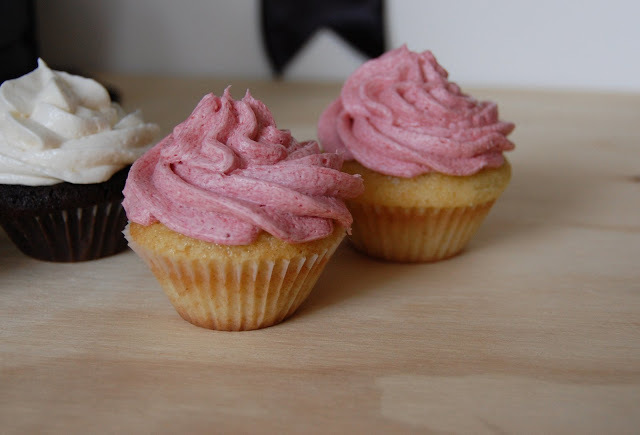 No, not raspberry (though that's in my arsenal as well) but strawberry buttercream! 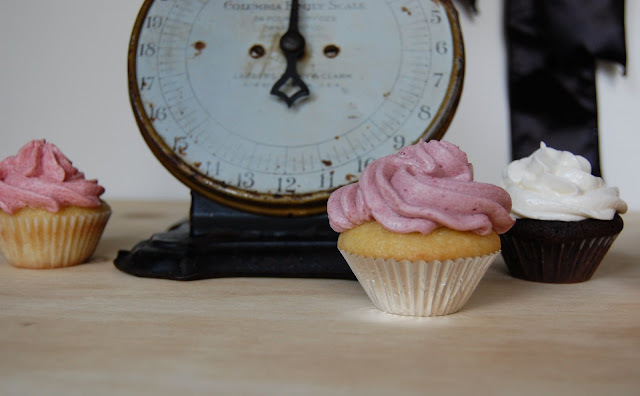 It's like a summer day turned into a mini cupcake! Good eye on the texture! Have a great holiday weekend, Kids! Oh my. This is your handiwork? Hello. I think you need to open up a little tiny bakery.